How on Earth Can Google Expect Us to Pay $1,000 for a Chromebook? Looking at the new Pixelbook from afar, it’s really hard to understand why anyone, let alone Google, could demand a retail price of $1,000 for this thing. It’s got Chrome OS inside—the operating system you stick in cheap laptops with cheap guts because it needs practically no processor power to run. And Google made no attempt to explain why a Chromebook should go for $1,000 during the presentation today. After playing with it, I’ve got a better idea of why Google would ask that kind of price. The most convincing reason is because this might be some of the nicest hardware to ever come with Chrome OS built in. A quick glance at the keyboard makes you think of the $1,000 Microsoft Surface Laptop. The great looking 3:2 display calls to mind an iPad Pro (around $900 with a keyboard case). Even the $100 pen and the ability to draw will have you feeling like you’re holding a Surface Pro (also starts at around $900 with pen). But two of those devices run Windows, and the other’s a tablet with iOS on it! 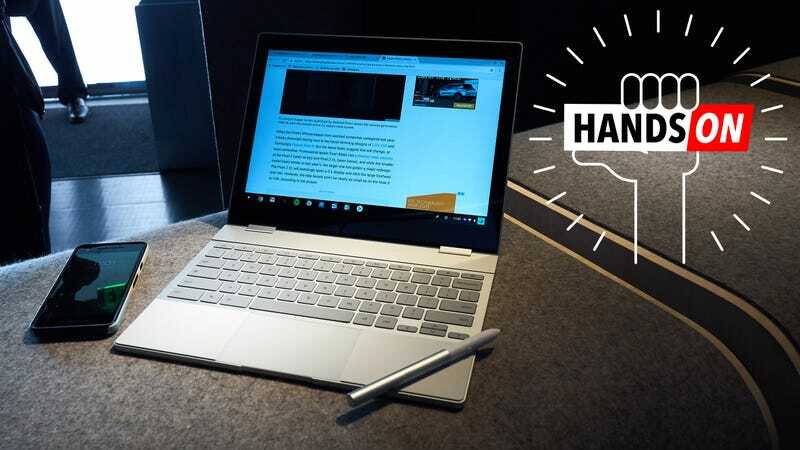 The Pixelbook is a laptop with Chrome OS and the ability to run Android apps. While Google reps assure Gizmodo the company is working closely with software makers to get Android apps looking great on the Pixelbook, there were only a handful of apps installed on the demo units, and they all still did that thing where the app frantically resizes once it realizes its on a big 12.3-inch display and not a tiny smartphone one. That doesn’t exactly inspire confidence. This stylus is a huge improvement over the one found in the Samsung Chromebook Pro. Chrome OS still needs to actually grow up. Great art apps and the claimed improvement to photo and art editing apps could help, but you still won’t be using this device’s ample storage, 16GB of RAM, or Intel Core processor for rendering stuff in 3D or editing a video. “We’re still working on that,” a Google rep told me when I asked about video editing. That feels like a lot of Chrome OS—a lot of promise I can’t necessarily count on. Let’s hope when the Pixelbook launches at the end of the month, Google will be able to deliver. This hardware feels like it deserves a great OS.